President Xi Jinping committed a further $60 billion in financial support for African development and reiterated China's approach to its relations with the continent in a speech at the opening ceremony of the Forum on China-Africa Cooperation (FOCAC) in Beijing on September 3. Xi hailed the principles of sincerity, real results, amity and good faith which continue to underpin Sino-African relations, and outlined China's position in its dealings with African countries. "We follow a five-no approach in our relations with Africa. No interference with African countries' choice of development path fitting their national conditions. No interference in African countries' internal affairs. No imposition of our will on African countries. No seeking of selfish political gains in investment and financing cooperation five-no approach with Africa," Xi said. According to Li Wentao, Deputy Director of the Africa Institute at the China Institutes of Contemporary International Relations, the five-no approach is an upgraded and extrapolated version of China's previous policy of non-interference. "Xi further clarified China's stance in its cooperation with African countries in direct response to international misunderstanding about the nature of the Sino-African relationship," Li said. Addressing leaders assembled in the Great Hall of the People, Xi said that the $60-billion in financing is to be made up of $15 billion in grants, interest-free loans and concessional loans, $20 billion in credit lines, a $10-billion special fund for development financing and a $5-billion special fund for financing imports from Africa. Chinese companies are also encouraged to make at least $10 billion of investment in Africa in the next three years. "China has honored its 2015 promise to provide Africa with funding support totaling $60 billion," Xi said of the commitments made at the FOCAC Johannesburg Summit three years ago, adding that "the financing has been either delivered or arranged." 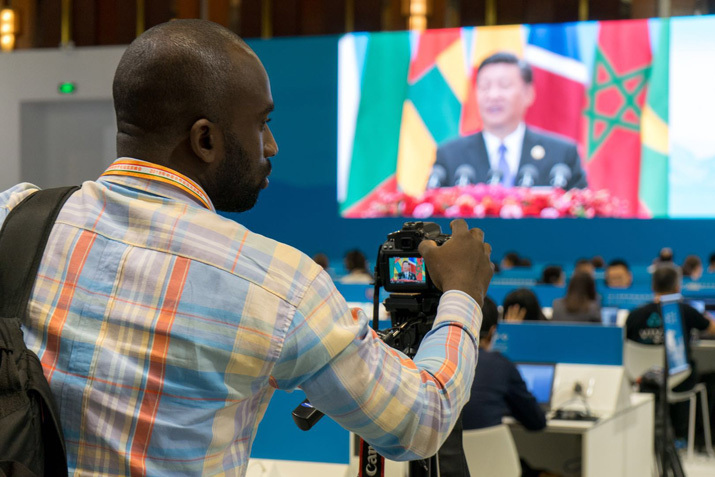 Woodajeneh Selamawit Kassa, an Ethiopian journalist reporting from the FOCAC media centre in Beijing, told Beijing Review that she agreed with Xi's assertions that China had come true on its 2015 promises. "It has been fully implemented in many countries. My country was a beneficiary of those projects; there have been roads and a railroad," she said. The $15 billion dollar grant pledged by Xi will be used to improve the livelihoods of African people through the construction of libraries, stadiums and other public facilities, according to Li. The $20 billion of credit lines will be deployed according to the market landscape, tapping areas and industries with high potential throughout the continent. He Rui, Associate Researcher with the China Institute of International Studies, said that a large part of the finance support will go toward the construction of infrastructure such as roads, ports, airports and railways. "This will form an infrastructure network which will contribute to the interconnectivity of Africa. However, China should conduct its financing strategy differently according to the conditions of the countries in which it is involved, which will have an inevitable impact on the implementation of the fund." "This is just the first stage of Chinese investment in African development. After the continent has been connected, Chinese investment can then be directed toward more advanced industries to facilitate Africa's industrialization," he said. "For a country to grow they need infrastructure, they need to integrate." Woodajeneh said. Xi outlined eight major initiatives to be implemented with the countries of Africa over the next three years in industrial promotion, infrastructure connectivity, trade facilitation, capacity building, healthcare, people-to-people exchanges, and peace and security. Opposing unilateralism and protectionism, Xi said that China would stick to a road of peace, prosperity, openness, green development and innovation, and bring together different civilizations while protecting the interests of developing countries. "China-Africa relations can become a pacesetter for building a shared community for all mankind," he said. Looking forward, He believes it important to guarantee that the $60 billion pledged by Xi is both effective and scientific in its implementation, so as to achieve inclusive development with benefits that reach African people. "In the years since the 2008 financial crisis, there has been a pessimistic feeling among the international community toward African development. But recently, there has been a surge in optimism, partly due to the fruitful outcomes of Sino-African cooperation," he said. "We still need more jobs, because Africa has a lot of youth and unemployment rates are still very high in African countries. So I expect more investment and I expect more jobs from Chinese companies, to actually see the win-win cooperation between Africa and China. Knowledge transfer is the key and capacity building is very important," said Woodajeneh. "My expectation is that as time goes on the relationship will become stronger than it is today…We hope that the momentum will be maintained," said Ahmed Wakili Bello, a Nigerian journalist reporting on the summit from the media center. In a show of good faith, Xi also revealed that the debt from interest-free Chinese loans would be written off in some of the poorest African states. "We welcome African countries aboard the express train of China's development," Xi said.